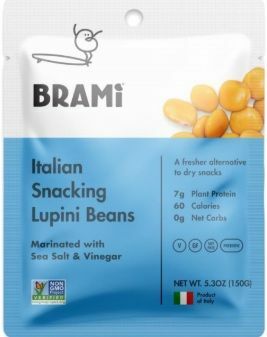 From one of the winner of 2018’s Top 3 Finds in the Hike category, comes BRAMI Lupini Snacks in new mini snack size packs! Yep, those Miracle Beans with all the same great benefits: high protein, high fiber, low carbs (zero net carbs thanks to the fiber! ), gluten free, probiotic, and loaded with minerals like manganese, copper, magnesium, phosphorus, potassium, and zinc. Remember that they’re easy to digest with a low glycemic index and are free of soy and cholesterol. They have 50% more plant protein than chickpeas and 80% fewer calories than almonds. These super portable 30 gram packets are just the right size to pop in your pocket for your hikes through the mountains or your ski runs or even as a quick snack stashed in your desk drawer. The above picture is a sneak peak at the new packaging that coming out soon with their most popular flavor, Sea Salt!